See the original CK722 spec sheet. 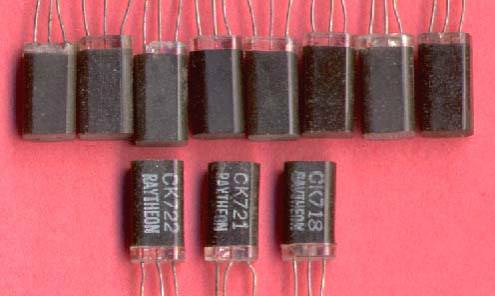 The original CK721 and CK722 was announced to the general public in the February, 1953 edition of Radio Electronics magazine. The CK721 was marketed as a high gain type. During the manufacturing process, functional units (shown in the top row of this figure) were sorted according to performance. Low noise/high gain types were labeled CK718 and supplied to hearing aid manufacturers. The CK722 label was reserved for the lowest performing units (which still met advertised specs) and were destined for the general purpose “hobbyist” market.